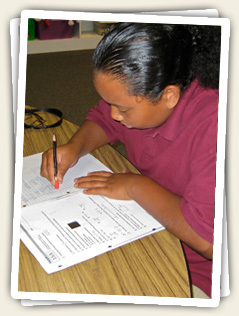 In the Primary and Elementary Modules, the highly acclaimed Connecting Math Concepts program, developed by Engelmann and his associates, and the Saxon Math programs are implemented to teach our students the critical mathematics skills that will fully prepare them to undertake the study of algebra and higher mathematics. The goal at Mt. Helix Academy is for students to develop fluency in math facts, computations, and math applications, so that they will enjoy and seek out this critically important subject area. 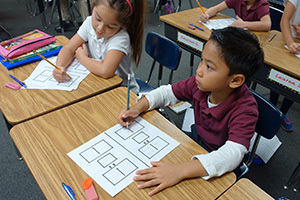 In the Connecting Math Concepts program, mathematical operations and concepts are introduced gradually and students are taught to understand the connections between concepts. Focusing on the big ideas of mathematics, students are instructed using explicit strategies that enable them to master difficult concepts such as ratios, proportions, probability, functions, data analysis, and word problems. Detailed explanations and guided practice move students toward successful independent work, ensuring mastery of each skill area. This strong skill base ensures that our students gain success and confidence as mathematical thinkers. Continued success in mathematics depends on a well-conceived curriculum and exceptional teaching. Beginning in Jr. High and for some upper elementary module students, mathematics up to and including Algebra I, Algebra II, and Geometry is taught using the McDougal-Littel Math program. The goal of this program is to provide students with a deeper understanding of mathematical concepts and how to apply them. Complex concepts are analyzed into simpler components. Instruction, practice, and assessment of those components are systematically distributed throughout the year. This distributed approach ensures that students gain and retain critical thinking concepts. Fluency building activities continue to be implemented daily in order to foster automaticity of facts and concepts, so students can easily generalize them to each level of the mathematics curriculum and to a variety of real-world applications.